Harvard Admissions received a record 39,506 applications in January, admitting 2,056 to the Harvard College Class of 2021. In January, thousands of prospective freshmen submitted applications in hopes of being accepted to Harvard College. Their long wait is finally over, as 2,056 of these students were invited today to join the Class of 2021. With a record number of applications, 39,506, the admitted class saw increases in the percentages of African-American and Asian-American students, as well as first-generation students and students from low- and moderate-income families, though it is statistically similar to the Class of 2020. Women constitute 49.2 percent of newly admitted students. Asian-American students make up 22.2 percent, African-Americans 14.6 percent, Latinos 11.6 percent, Native Americans 1.9 percent, and Native Hawaiians 0.5 percent. First-generation students constitute 15.1 percent of those admitted. The majority of Harvard students receive need-based aid, and the average family contribution for those receiving aid is $12,000. Families with incomes up to $150,000 and typical assets pay 10 percent or less of their annual incomes. Oladitan remembers meeting a Harvard admissions officer at a college fair at her high school, Brooklyn Technical High School, in New York City. 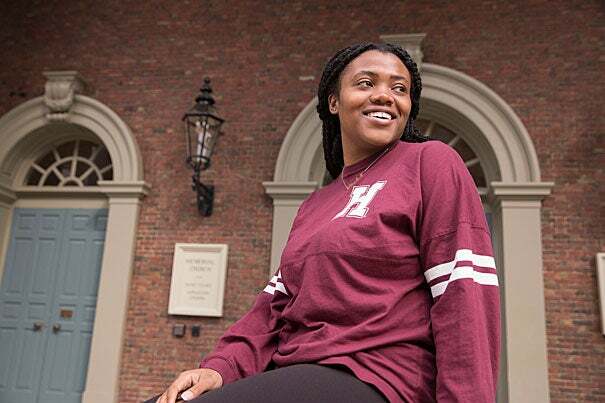 “I saw an opportunity to ask questions about the application process and Harvard in general that I wouldn’t easily be able to get from a website,” she said. For the admitted Class of 2021, 21.4 percent come from the mid-Atlantic, 18.7 percent from the South, 16.5 percent from New England, 15.7 percent from the Pacific, 15 percent from the Midwest, Central, and Mountain states, and 0.3 percent from American territories. International students constitute 11.4 percent of the admitted students. As for intended academic concentrations, 26.5 percent indicated an interest in social sciences, 19.3 percent in computer science and engineering, 19.2 percent in the biological sciences, 15.5 percent in the humanities, 7.2 percent in mathematics, 6.9 percent in the physical sciences, and 5.4 percent were undecided. Current Harvard students also play a vital role in undergraduate recruitment. As members of critically important student groups, including the Undergraduate Minority Recruitment Program (UMRP), the Harvard First-Generation Program, and the Financial Aid Initiative, these students make phone calls, send emails, conduct tours, and host admitted students. 2016 Fannie Cox Prize recipients Martin Nowak and Elena Kramer were chosen for their "ability to teach challenging concepts with clarity and inspire undergraduates to pursue careers in the sciences,” said Edgerley Family Dean of the Faculty of Arts and Sciences Michael D. Smith.